Teapot (Toughness: 3) - Fast and dangerous. It sometimes decides to charge toward you at high speed. When it does, it is usually safer to move out of its way than to try to hit it, especially when you have minimal attack strength. The tea cups released are tricky and dangerous too. The Secret Bonus is to the lower left of the first phone booth. You can adjust the score with nearby items or the umbrella. The fires on both sides of it are false ones. Be sure to open the ? box above it first. If you open the bottom box first (as in the picture above), you won't be able to pick up the Secret Bonus. As you are forcing the door, a teapot appears above, and it may be right there waiting for you when you come back up. This may be quite bad, if you are a kid without the P power. Even if you have the P power, the teapot may make it difficult for you to deploy icons and get the red jewel when it regenerates after being destroyed. A good way to avoid all these troubles is to wait on the leftmost side in the jar's room and lure the teapot to sink into the space to the left of the telephone booth. 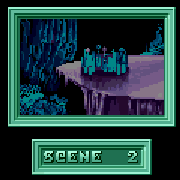 This scene is not as easy as scene 1, for the teapots are stronger and faster, and they can float in mid-air, too. Without the P power, they are deadly - until the player realizes that he doesn't have to fight (or destroy) most of them, if he keeps moving. There are also lots of fires everywhere, and a few tricky moving boxes. Beginners may want to pass up some of the food, rather than to struggle with teapots while trying to collect them. Starting with Naoki is recommended, for better jump, power, and speed. His hovering is adequate for everything up to the first telephone booth. Try to do everything without getting into too much teapot fighting. You may wish to start with a detour. It takes more time, but you will encounter fewer teapots. 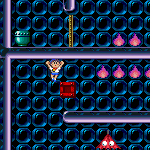 At the very start (after picking up the first set of 5 sake), jump atop the higher food pots in the room (only Naoki or Makoto can jump high enough), and from there break my way through the fake floor. 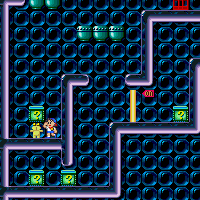 (When going by the normal route, be careful not to fall through this fake floor!) Then work your way in reverse back to the start, forcing the door from the other side. (The beginner may instead skip this part and leave.) This route is especially recommended when one starts the scene with a P power icon in stock. Alternatively, one may also return to the starting point through the fake floor, and force the door from the normal side. If you have Makoto, you may consider starting with him. The advantage is that Makoto can jump high enough to leave through the fake floor even after getting all the food, so you never have to deal with the heavy door. Do break the fake floor before opening the food pots directly under it, because the teapots below can be very dangerous if you are jumping repeatedly looking for the square hit to break the floor. You have to be extra careful when playing with Makoto: he is somewhat more unwieldy than the kids because of his large size and poorer hovering. Change as soon as possible when you reach the next phone booth. Between the first two ON gates, there is a passage with lots of ? boxes (all containing Smileys) in your way. If you are using a kid, avoid the light switch, and try to make a path breaking only one of a pair of ? boxes. This way, the teapot can't chase you. There are two ways (in additional to the broom) to get pass the moving box above the first telephone booth; you can't pass below the box. 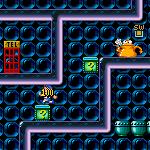 You can either jump up from below to right of the box when the box is at the far left (a beginner may find this easier if he leaves the food pots intact), or you can wait at the left end of the corridor, and jump on top of the box when it comes and walk to its right. 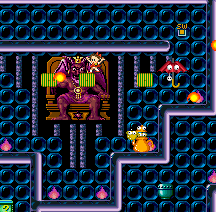 Most enemies in this room can be banished by returning to the lower part of the room (near the ON gate entrance). Immediately after the cockroach trap, there is a vertical room with an umbrella at the top. You can banish the umbrella by touching the lower right corner of the room. However, it will shortly reappear, and you can't repeat the trick. In the room behind the heavy door, there is a dangerous teapot. 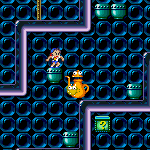 If you don't have the P power to easily destroy it, you can avoid it by opening only the pot on the left, and jumping atop the other pot, and jumping over the teapot from there. If you want the food, you can come back later when the teapot has left. Alternatively, you can deploy a Stop icon here (pick it up after forcing the door); the two fires closest to the door are false. 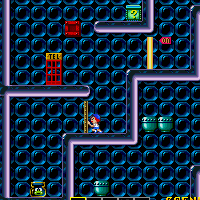 After passing that room, there is another dangerous vertical room with two moving boxes, a teapot and an umbrella. If you have the P power, jumping from atop the telephone booth, Naoki can jump on top of the ? boxes, while Akiko can jump onto the higher moving box. Otherwise, you can either jump directly from one moving box to another, or jump onto the ? boxes from the first moving box. You may want to hit one or both of the ? boxes first, if you feel that they're in your way. 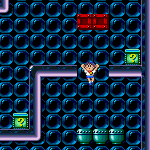 Using Naoki, you can do this by jumping from atop the telephone booth. You can also hit a ? box from below by jumping from the first moving box. Of course, if you have Makoto, you can jump to wherever you want, but it isn't quite worth it to use him here, considering his general unwieldiness. In the following area where you go diagonally left and down, half of the fires on the floor are false (including the very last one), though normally one should be able to clear that area without needing to touch the ground. You can use the same method to hit Zara as scene 1, but here you have to do it closer to Satan, and there's the risk that you may be roasted by a fireball before you can move! If you succeed, the fight is pretty much over all the same. Akiko is preferred, in case you end up fighting without the broom. She can hover to avoid the light switch, then approach Satan hovering along the ceiling, hitting (and stunning) the umbrella on the way. To get the All Gold Bonus, it is necessary to avoid needless fights with teapots unless one is born with a special talent in modulus counting, or has a 'navigator' sitting beside him doing the counting. See the Strategy section. Start with Naoki, get the first set of 5 sake, then use the detour through the fake floor and get all the food in the area. (Alternatively, one can start with Makoto.) In the room with the Secret Bonus, use the break point if you need to. After this, only 2 sets are left, so the rest is rather straightforward. When you're not sure of the count, remember that you don't have to immediately pick up a piece of food you open. This page was last edited on 13 December 2010, at 17:03.